Betrayed by Vesper; the woman he loved; 007 fights the urge to make his latest mission personal. 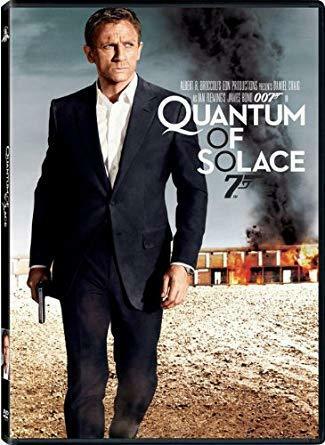 Pursuing his determination to uncover the truth; Bond and M (JUDI DENCH) interrogate Mr. White (JESPER CHRISTENSEN) who reveals the organization which blackmailed Vesper is far more complex and dangerous than anyone had imagined. Forensic intelligence links an Mi6 traitor to a bank account in Haiti where a case of mistaken identity introduces Bond to the beautiful but feisty Camille (OLGA KURYLENKO); a woman who has her own vendetta. Camille leads Bond straight to Dominic Greene (MATHIEU AMALRIC); a ruthless business man and major force within the mysterious organization. On a mission that leads him to Austria; Italy and South America; Bond discovers that Greene; conspiring to take total control of one of the world's most important natural resources; is forging a deal with the exiled General Medrano (JOAQUIN COSIO). Using his associates in the organization; and manipulating his powerful contacts within the CIA and the British government; Greene promises to overthrow the existing regime in a Latin American country; giving the General control of the country in exchange for a seemingly barren piece of land. In a minefield of treachery; murder and deceit; Bond allies with old friends in a battle to uncover the truth. As he gets closer to finding the man responsible for the betrayal of Vesper; 007 must keep one step ahead of the CIA; the terrorists and even M; to unravel Greene's sinister plan and stop his organization.